Separated by 3,230km of ocean, the island of Newfoundland is among Ireland’s closest westerly neighbours (map courtesy of Finnian Ó Cionnaith). Talamh an éisc. The fishing grounds. Newfoundland. This rocky island sits on the edge of the Grand Banks, the shallow ocean plateau that runs along the northeast edge of North America. It’s the fabled destination of Irish monks, Vikings, and fishermen. And it’s the island portion of Canada’s most easterly province: Newfoundland and Labrador. With a population of 519,716 as of 2016 and a total land mass of 370,514.08 km2, it is among Canada’s most sparsely populated provinces (1.4 people/km2; visit Statistics Canada for more information). Originally the home of the indigenous Beothuk, Mi’kmaq, and Inuit peoples, since the 15th-century arrival of Genoese explorer, John Cabot, the island has been colonised and contested by Europeans with interests in its rich natural resources. The inhabitants of Newfoundland have tended to cluster along the coastline in groupings known as outports: communities built in the small coves and inlets of the island’s 9,656 km of coastline. Historically, these were spots with the best access to the fisheries and Newfoundland’s limited arable land. Often they were accessible only by boat. Colonised by a combination of French, English, Scottish, and Irish settlers, shaped by ongoing in- and out-migration, and influenced by still-vital (though decimated) Indigenous cultures, 21st century Newfoundland has a richly varied island culture and provincial identity. But while there is an incredible diversity of influences, traditions, and identities within Newfoundland, a sense of Irishness is embraced by cultural revivalists, the tourism industry, and even policy makers. In 1996, Premier of Newfoundland Brian Tobin and Irish Taoiseach John Bruton signed a Memorandum of Understanding between Newfoundland and Ireland. The Memorandum recognised the historical connectedness of the two regions, but also formalised ongoing ties between the cultural, education, and business sectors of Newfoundland and Ireland. Estimates based on the 2016 Census of Canada suggest that only 20.7 per cent of the province’s total population claim Irish descent (see Statistics Canada 2017). And yet, the Irishness of parts of Newfoundland is undeniable. It’s in the accent and dialect, the folkways and oral traditions, the role of the Catholic Church, and the songs, music, and dance. It’s celebrated through festivals, museum exhibitions, iconography, and the sustained circulation of music, song, dance, and other forms of culture. Irish singer Dolores Keane and the members of Reel Union sitting on the bandstand in Bannerman Park, St John’s, during a concert tour that saw them perform at the 1978 Newfoundland Folk Festival. Dolores Keane learned to sing “The sweet forget-me-not” on one of her visits to Newfoundland (photo courtesy of Aidan O'Hara; used with permission). 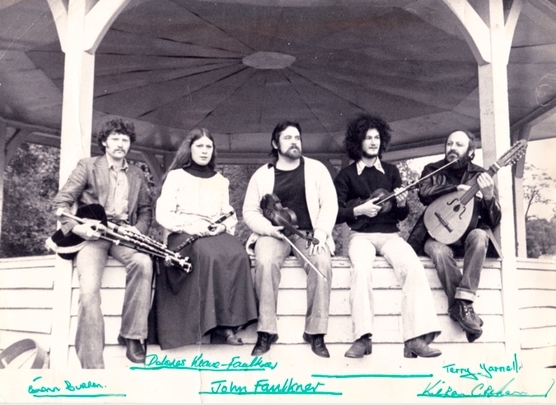 Éamonn Curren (uilleann pipes), Dolores Keane (flute), John Faulker (fiddle), Kieran Crehan (fiddle), and Terry Yarnell (mandolin) during their visit to St John's, Newfoundland. These connections come from the historical settlement of Newfoundland’s cities and outports. Unlike many Irish diaspora communities that grew in the wake of the Famine (or the more recent economic crash of 2008), the majority of Irish settlement in Newfoundland happened during the 18th and early 19th centuries. Map of Newfoundland. 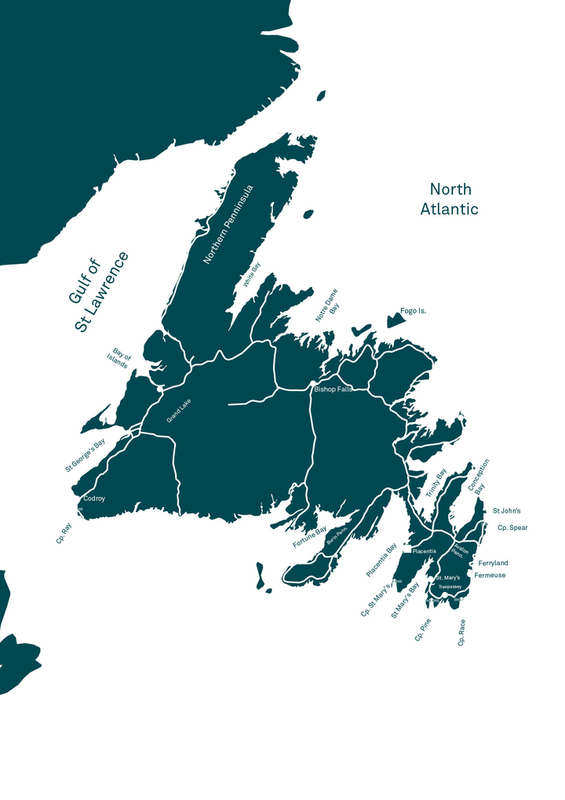 Irish immigrants mainly settled in the outports between St John’s and Placentia Bay (map courtesy of Finnian Ó Cionnaith). Between 1790 and 1835, 30,000–35,000 Irish immigrants settled in Newfoundland. They were drawn to the opportunities that the fisheries and related industries offered. And when they came, they settled in groups in places like Notre Dame Bay, St John’s, the Southern Shore, and the Cape Shore—ethnic enclaves that, in some cases, remained relatively isolated until well into the 20th century. The Cape Shore immigrants were by far the most isolated ethnically. Along the fifty-mile stretch from Point Verde to Branch, there were no non-Irish settlers, and apart from 30 English inhabitants in the most populous settlement in Placentia, the entire littoral from Long Harbour to Trepassy was exclusively southeastern Irish. Indeed, it is likely that many of these Cape Shore immigrants and their descendants lived out their lives without any contact with members of another ethnic group. When Aidan O’Hara visited the Cape Shore more than a century later, he observed and recorded the effects of living in an isolated enclave. Many of the people whom he recorded sang songs that mentioned places in Ireland—places like the Comeragh Mountains, the Blackwater, Wexford, or Banna Strand. Brennan on the moor, song (It's of a fearless highwayman the truth to you I'll tell …) Probably of Irish origin, this broadside ballad tells the story of folk hero and highwayman Willie Brennan, who was tried and hanged in Clonmel in 1804. Some versions of this song place Brennan in the mountains near Limerick; other versions depict Brennan on the highways of North Cork and South Tipperary. Patsy Judge’s version references the Comeragh Mountains, perhaps a nod to the ancestry of the people of the Cape Shore, whose origins were mainly in Ireland’s southeast. At least some of these songs appear to have been passed down from the Irish immigrants who came to the Cape Shore during the 18th and 19th centuries. Ellen Emma Power, for example, sang what she very simply called “An Irish Song.” Clearly a version of the well-known “Siúl a ghrá,” her rendition demonstrates the effects of language loss over multiple generations (the Irish language rarely survived beyond the first generation in Newfoundland). Conversations with community matriarch, Caroline Brennan of Ship Cove, also suggested the continuing influence of Irish language and folk culture within Cape Shore communities. A typed transcript of a conversation between Aidan O'Hara and Caroline Brennan. Caroline Brennan describes a rhyme in Irish said over a baby's crib, phrases used as greetings, and old superstitions about the banshee. Born in 1892, Caroline Brennan possessed a prodigious memory for the songs and history that linked Cape Shore Newfoundlanders to Ireland. She knew the communities in Ireland where her ancestors came from, and she had a keen interest in understanding the names, expressions, and superstitions that originated in Ireland. Caroline was a third generation Newfoundlander. Her grandmother, Bridget Power, came over to Newfoundland in the 1840s—one of the last to arrive as part of a trans-Atlantic migration inspired by codfish. During the 18th century, Newfoundland’s fisheries were seasonal. French, Basque, Portuguese, and British merchants all sent out ships to fish the Grand Banks, but they relied on migrant workers rather than permanent settlement. 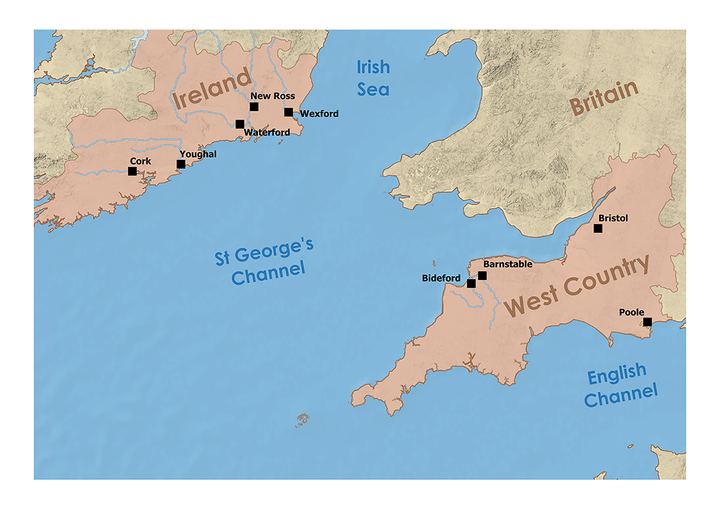 Ships setting out from West Country ports in England—like Bristol, Bideford, or Poole—did much of their provisioning in southeast Ireland. Merchant ships called into the ports of Wexford, Waterford, and Cork, picking up the high quality and affordable salted goods for which Ireland was then known, before setting out for Talamh an éisc. The port cities of West Country England and southeast Ireland were focal points of the transatlantic trade with Newfoundland (map courtesy of Finnian Ó Cionnaith). West Country ships also picked up Irish labourers on their stopovers. In early years, men contracted for two fishing seasons and simply had to winter once in Newfoundland before returning to their families in Ireland. During the 1770s (the peak years of the seasonal fishery) approximately 5,000 Irish migrants made annual journeys to Newfoundland. 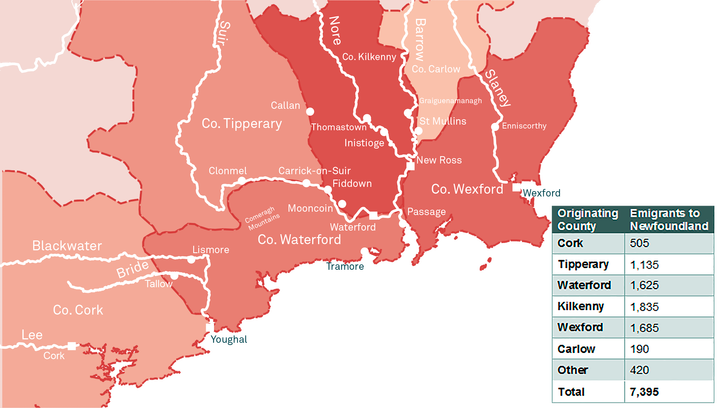 A significant number of these men (and, to a lesser extent, women) came from communities situated within a 50-kilometer radius of Waterford City. Many of these communities were situated along the tidal stretches of the Rivers Slaney, Barrow, Nore, Suir, Blackwater, Bride, and Lee. Emigration from southeast Ireland to Newfoundland. The majority of Irish emigrants to Newfoundland came from the southeastern counties of Ireland. This map shows the ports (▪) and communities (•) that were most closely involved with the Newfoundland trade. It is also a heat map, with the colour of each county depicting the intensity of out-migration to Newfoundland (map by Finnian Ó Cionnaith, based on research by John Mannion 1990:346). 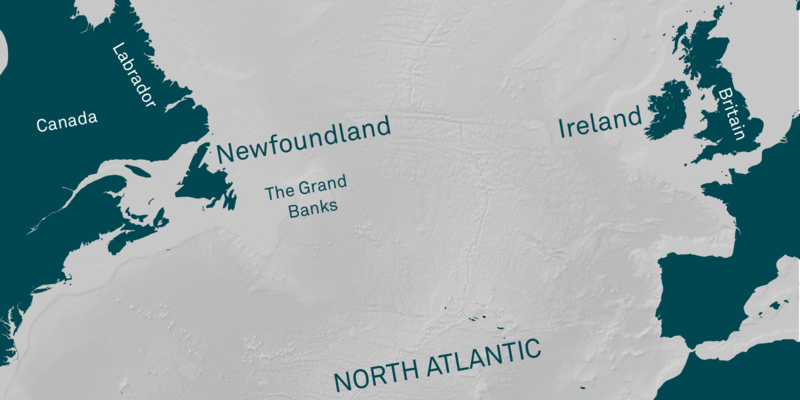 The details depicted in this map are based on research completed by historical-geographer John Mannion of Memorial University of Newfoundland. Dr Mannion traced the parish origins of 5,500 Irish immigrants to Newfoundland, and the county origins for another 2,000. While extraordinary, this information probably only accounts for about 20 per cent of the total Irish immigrants to Newfoundland, and most of this information pertains to the men and women who settled in St John’s. I would advise you never to send out more English youngsters than will just clear the vessels. They run away in winter, they never stick to a place, have any attachment to it. And for hard labour one Irish youngster is worth a dozen of them. Thomas Saunders of the Saunders & Sweetman Company to his brother on the most desirable contractors for the Newfoundland Trade (quoted in Mannion 1987:382). As time went on, trade links and the structure of the fisheries were solidified. Fishermen, farmers, and labourers brought their families to settle in the outports of Newfoundland. And, too, the Napoleonic Wars and the accompanying Atlantic blockade occupied English and French naval and merchant fleets: a situation that created a prime opportunity for Irish immigrants to establish themselves—and a domestic fishery—in Newfoundland. Unlike later waves of emigration from Ireland, the people going out to Newfoundland came from a broad spectrum of socioeconomic circumstances. These were not people pushed out by economic or political necessity, but, to a certain extent at least, people seeking opportunities. Some of them had experience working in Newfoundland’s fisheries. Others were farmers or labourers. And some came from merchant families. Born in 1892, Caroline Brennan’s grandmother, Brigid Power, was among the last of the Irish brought to Placentia by the Sweetman Company. Before singing “The Blackwater side,” a song she learned from her grandmother, Caroline describes the people who first settled on the Cape Shore. The Blackwater side, song (Ye lads of this nation of low and high station, I pray pay attention and listen to me …) Caroline Brennan introduces “The Blackwater side” with a story about her grandmother, “Irish Biddy,” and the time that she spent working in the Sweetman Company’s sail loft in Placentia. This was one of the songs that she sang to remember Ireland. The song tells the story of a couple who court on the banks of the Blackwater. A variant version of “The Blackwater side” was collected by Kenneth Peacock in 1951 and published in Songs of the Newfoundland Outports 2 (1965:503–504). New Ross, Co Wexford was at the epicentre of a small independent trade with Placentia, Newfoundland. Wexford man Richard Welsh (1718–1770) first arrived in Placentia in 1734 to work in the fisheries. He learned the ins and outs of the trade and eventually rose to prominence as a merchant. In 1759, he was granted status as a freeman of Ross, a change in status that enabled him to consolidate a merchant dynasty with connections in Waterford, Wexford, the West Country, Iberia, and Newfoundland. The company that came to be known Saunders & Sweetman—eventually simply as Sweetman—was directly responsible for settlement of the Cape Shore (Mannion 1987:376). Between 1800 and 1840, the Sweetman Company promoted settlement and expansion along the shores of Placentia Bay, particularly in the area just to the south of the town of Placentia. Unlike other parts of Newfoundland, settlement in this area was focused on developing farming communities that could supply the needs of the Sweetman Company’s fishing and shipbuilding businesses. Like planters in the fishery they were supplied by Sweetmans, on the promise of agricultural produce in the fall. A few farms were managed initially by Sweetman servants—Bruley, Point Verde, Barrasway, Point Lance, Marticott—but most were owned from inception by their occupiers, others purchased later as the Sweetman dynasty declined. A typed transcript of a conversation between Aidan O'Hara and Caroline Brennan. Caroline Brennan describes the places from which her family emigrated, including Carrick-on-Suir, Waterford, Fiddown, and Mooncoin. About 50 Irish families established farms along the Cape Shore. The oldest farm on the Shore was founded as early as 1782 by John Lambe at Great Barasway. John Skerry of Mooncoin, Co Kilkenny, settled Ship Cove with his family around the turn of the 19th century. And in 1802 the Conways established stock farms in Distress Cove—later renamed St Bride’s. In total, about 50 Irish families settled farms along the Cape Shore (Mannion 1987:410). When Aidan O’Hara visited the Cape Shore in the 1970s, he met the grandchildren, the great grandchildren, and the great great grandchildren of these early Irish immigrants to Newfoundland. For many of the older people—like Dennis McGrath of Patrick’s Cove, Caroline Brennan of Ship Cove, or Henry Campbell of Branch—a sense of time and generations passing is missing from their accounts of Irish connections; they spoke of the parents, grandparents, aunts, and uncles who emigrated from Ireland as though they were living in a house up the shore. They described the places they came from—Thomastown, the Blackwater, Waterford—and their music as recent memories. Excerpts from an ITMA interview with Aidan O’Hara. Aidan describes his first visit to the Cape Shore in the company of Prof John Mannion, a meeting with John Keefe in Placentia, and the long memories of the people he encountered on the Cape Shore. Aidan O’Hara describes his first visit to the Cape Shore, meeting John Keefe in Placentia, and the way that Ireland was remembered by the people whom he encountered. This conversation is excerpted from a longer interview that focused on Aidan’s years in Newfoundland, work as a broadcaster in Newfoundland, and relationship with the people of the Cape Shore.